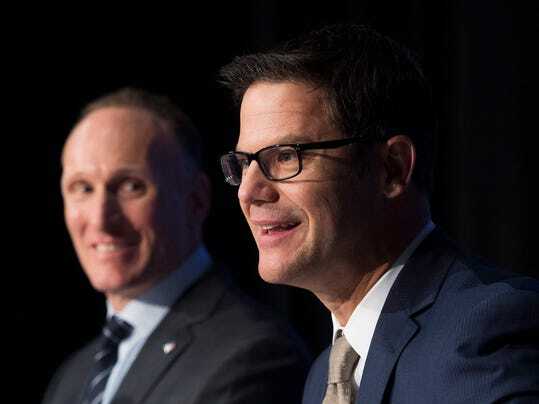 TORONTO (AP) — Toronto general manager Ross Atkins takes over a team that made the Blue Jays’ first postseason appearance in 22 years. Atkins was introduced Friday at Rogers Centre. He recently served as Cleveland’s vice president of player personnel under Mark Shapiro, who became Toronto’s president last month. Tony LaCava, who served as interim GM after the departure of Alex Anthopoulos, will return to his assistant GM role and also serve as senior vice president of baseball operations. The Blue Jays won the East Division title last season with a 93-69 record. Their postseason ended with a loss to Kansas City in the AL Championship Series. Anthopoulos announced shortly after the team’s elimination that he’d declined a contract offer to return. The 42-year-old Atkins is the seventh general manager in Blue Jays’ history.